Your honey products are unique to your brand, and your area. With custom printed labels, you can personalize your line of honey products just the way you want them. We have free laser die cuts, so your labels can have custom shapes that match your packaging, your brand, and are uniquely yours. Custom labels are digitally printed with full color, so your designs can have as few, or as many colors as your labels need. Free laser die cuts mean your labels can be a classic or custom shape to meet the needs of your packaging and branding. Self-adhesive and resistant to oils and waters, our custom labels are long-lasting for a professional application. 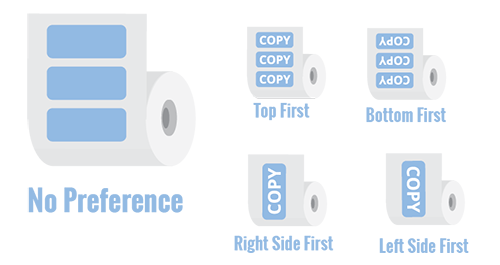 Your labels can be oriented on the roll for easy application by hand or with a machine. With digital printing and custom shapes, we can print some incredible detail with your designs. Get all of the details your packaging needs including, amount, nutrition information, and all of the information about where your honey comes from, that make your products unique. 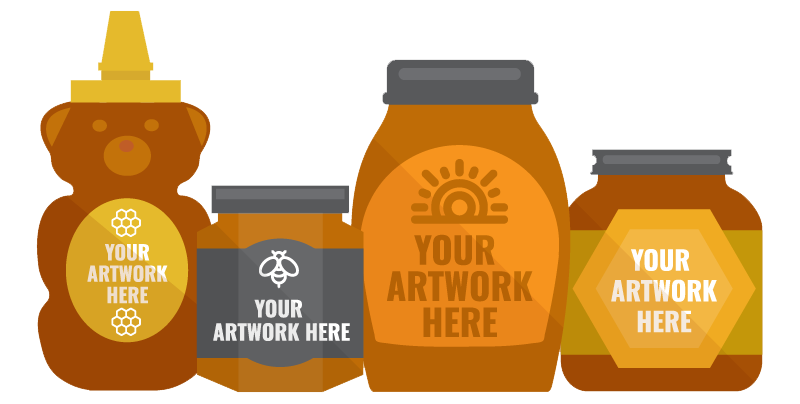 From classic ovals, and rectangles to labels shaped like hexagons that make up a honeycomb you can bring out your unique designs in the artwork and shape of your custom labels. Custom shapes also mean you can find the size of label that works best for your packaging. Choose a larger label for larger containers, or include smaller designs to fill in valuable packaging real estate on the tops or sides of your jars or bottles. 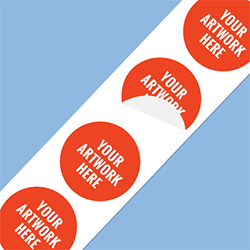 If you’re not sure what size of custom label will work best for your needs, you can find tips for that on our page all about choosing the best size of sticker or label. These custom and durable labels will resist oils and water, making them perfect for a long lasting application, even when packaging products that have some sticky tendencies like honey or beeswax. All of our custom labels are self-adhesive and work well on plastic or glass jars and bottles for a professional application on a variety of containers. Custom labels are easy to apply by hand, and can also be oriented on the roll if you plan on using a label application machine. You can choose from one of four different directions to meet the needs of your application machine, and you can find more details about how we orient your labels on a roll on our Custom Labels page. If you know your products will be on display or used in an outdoor setting, or if you just want an outdoor durable option, you can also try Kiss Cut Stickers, which can be finished on a roll. Kiss Cut Stickers are also an easy to manage option as an additional sticker that you could include as a small customer gift with a purchase of your custom honey products as well. You can choose from Glossy White, Matte, or Clear Labels to match your honey products and packaging needs. Glossy White Labels are a popular option that allows for printing just about any colors your designs have, with an added shine to help your products get noticed. Matte Labels are printed on a white polypropylene with a soft matte lamination for a satin-like appearance. Matte Labels are also easy to write on with a permanent marker, so you can use them for a variety of handcrafted products. Clear Labels are an ideal choice when you want your honey and packaging to show through your labels and branding designs. 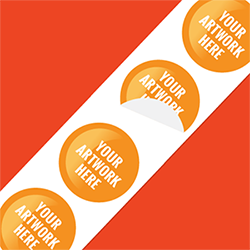 With Clear Labels you can add a layer of white behind your designs to enhance the opacity of the artwork in your labels. 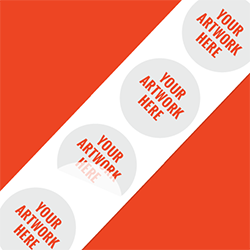 Or, you can choose to have your labels printed without this, for a more transparent look in your designs and packaging.